By Jeff Hoffer Bryan QB Nate Miller is hit by a Clear Fork defender Saturday night. By Jeff Hoffer Colts QB Jared Schaefer scrambles for yardage against Bryan. 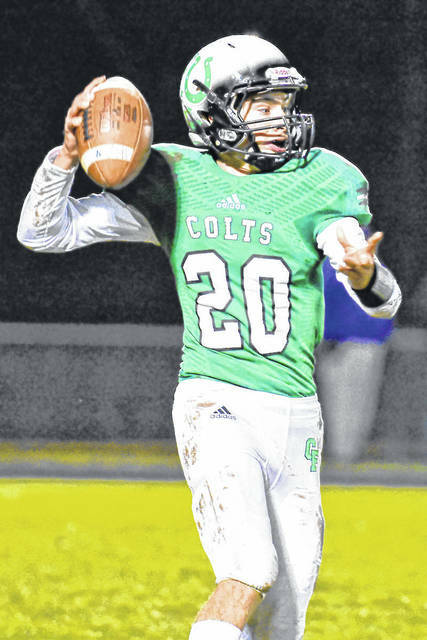 By Don Tudor Clear Fork’s defense stopped Drew Peters and his Bryan teammates for most of the night in a 20-6 victory Saturday at the Colt Corral. By Don Tudor Brennan South sets up to pass for Clear Fork in its Division IV regional semi-final win over Bryan. BELLVILLE — Michael Chillemi speaks softly and plays a big game. 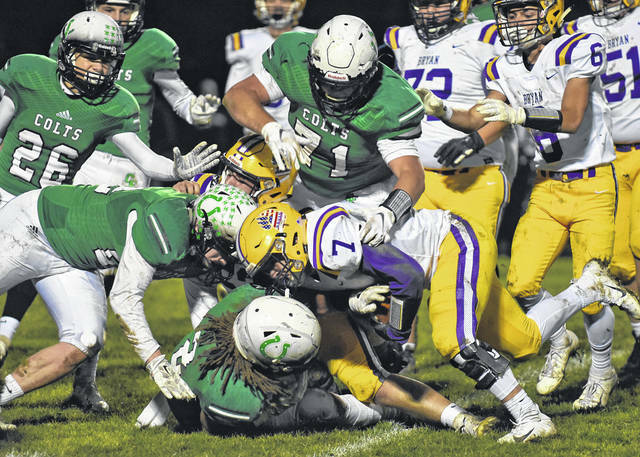 The 6-2, 265-pound senior lineman had a second-quarter interception and he and his defensive teammates provided a lift to Clear Fork in its 20-6 regional quarterfinal win over Bryan here Saturday night. “I was just firing out doing my pass rush and I got the ball,” on a screen pass by Golden Bears quarterback Nate Miller. On the night in which defense dominated, Chillemi registered 9 tackles and a sack. Lyon’s Pick 6 put the hosts ahead 14-6 with 8:45 left in the game. Tollison added 7 tackles, Trevon Trammell, Schaefer and Lyon with 5 each. “They had a great defensive game plan. We couldn’t get our offense going. Turnovers, holding, off-sides,” Carroll said. The Colts were flagged 7 time for 75 yards. 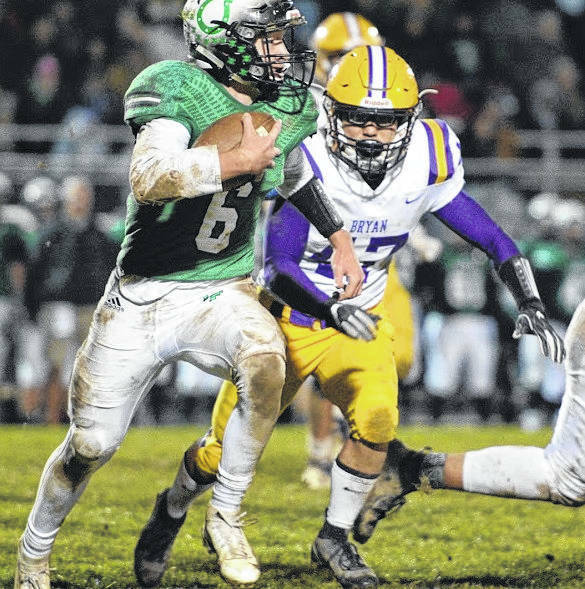 Clear Fork (11-0) plays Lorain Clearview Saturday night in a Division IV regional semi-final at 7 p.m. at Wooster High School. Clearview knocked off Highland, 30-16, in the first round. Miller’s 5-yard run put Bryan ahead 6-0 at the end of the first quarter. On the night the all-conference QB hit on just 11-of-29 passes for 76 yards, with three interceptions. A 65-yard slant pass from Jared Schaefer to Caden Flynn put Clear Fork ahead 7-6 at halftime. But it was the 20-yard Pick 6 by Lyon and Brady Tedrow’s 2-yard TD run that sealed the win. “Some of our kids were not blocking very well, not coming off the ball. We’ll look a the film and figure it out,” Carroll said regarding the slow start offensively. Schaefer wound up leading the team with 100 rushing on 20 carries. Trammell was held to 45 on 14 trips. Schaefer and Brennan South combined to throw for 100 yards on 5-of-17 passing. The Colts limited Bryan to 24 net yards on 30 carries and 8 first downs. The Golden Bears finish the season at 7-4. Chillemi said the Colts knew they had to pressure Miller in the pocket. “We had an eye after the quarterback. Our intensity was to the max,” he said. The strong line play this season comes as no surprise. “We all came back. We know what we’re doing. We just wanted to play as well as we could,” Chillemi said. Carroll said his squad knows Clearview. 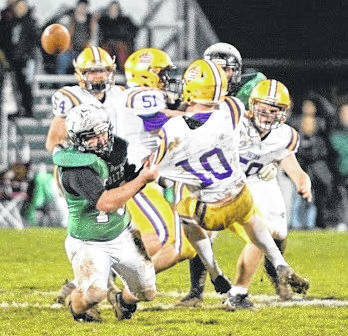 Last year the Colts prevailed 44-0 in a first-round game against Clearview.